Today we’re celebrating the Lunar New Year and I’ve been watching my clock for a thousand times. I just want to escape from work and get ready for dinner. Today is the day where we get together with my side of the family. We did not plan anything fancy as it falls on a weekday but Mom has been telling me about all the delicious meals she prepared for us. As for me, I’ll show up with these eggrolls tonight. 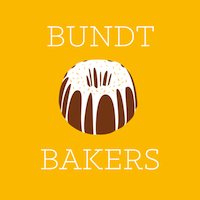 Well, bundt cake is back. I’ve been keeping this secret for a long time and I’m glad I can finally let it out. This dark chocolate bundt cake is da bomb! I made this a while ago when I had huge cravings for chocolates (I take that back because there’s no day that I don’t crave for chocolates). This bundt cake puts a big smile on my face. It stays so moist even for this the next day. Its rich chocolatey texture along with the pomegranate syrup adds extra crunchiness and sweetness. It also enhances the presentation. And big thanks to Tanya Gal of DessertStalking Blog for hosting this month. Be sure to check their site for some awesomelicious sweets recipes. …and don’t forget to add me on Instagram for more stories of BYB 2015! Generously greased and flour a 12-cup bundt pan. In a small saucepan, melt the chocolate over low heat, stirring constantly. Scrape the chocolate into a medium bowl and let cool slightly. Whisk in the oil and sugar until smooth, then whisk in the egg. In another bowl, whisk the flour, cocoa powder, baking soda, and salt. Add half of the flour mixture to the chocolate mixture, followed by 1/2 of the coffee and 1/2 of the milk. Whisk until smooth. Add the rest of the ingredients until well combined. Bake in the oven for 45 minutes. Let the cake cool on a rack for 10 minutes, then turn it out and let cool completely. Pour the pomegranate syrup the cooled cake. Pomegranate syrup: In a small saucepan, add the brown sugar and water over high heat and keep swirling. When it begins to caramelize, lower the heat and let the syrup thicken for 5 minutes before you add the pomegranate seeds. Nice bundt and what a great touch to it with the pomegranate topping. What beautiful photos! That shot of the interior of the pomegranate is gorgeous! I’ve been crazy for pomegranates this month. Must be something about valentines day? Your cake sounds delicious- what a fun combination. I am seriously in love with this bundt! The chocolate looks so rich and delicious…and that pomegranate syrup? Don’t even get me started on that! Well done! Happy New Year, Linda!! (Is there any cake left? Because I could use a slice right about now…) Pinned! I would not have thought of pairing pomegranate and chocolate, but I guess the sharpness of the seeds contrasts with the richness of the chocolate. Beautiful chocolate bundt. I love the addition of pomegranate. I can’t even remember the last time I had pomegranate… I should remedy that. This cake looks WONDERFUL! Love pomegranates and they are so pretty with your bundt!! I just know this is good! Do you know those Brookside chocolates? My husband brought home a bag of the dark chocolate pomegranate ones – I was hooked. I will definitely be giving your recipe a try. Such a beautiful combination the pomegrenate and the chocolate, love it!! Linda, I’d love to go with you to your mom’s house for the Chinese feast!!! yummm! Happy Chinese New Year! and this bundt cake is gorgeous!!! The pomegranates are like little jewels sparkling brightly and showcasing the dark richness of the cake. Beautiful. That moist chocolate with the pomegranate rubyness has class written all over it. Such a beautiful cake. Gong Xi Fa Cai, Linda! So delighted that you were able to spend the lunar new year with your family! I miss the celebrations from when I lived in Southeast Asia. What a beautiful chocolate Bundt and those red pomegranate arils are perfect for the holiday. Beautiful and extremely original. Happy New Year! and congratulations on your Bundt! Pomegranate syrup is just delicious!!! I love it when I tried!!! It’s a beautiful bundt!!! Great!!! Sounds delicious!!! And the topping is lovely!!!! Lovely bundt cake, it looks so chocolatey and moist, yum! The pomegranate is such a beautiful touch!! Gorgeous bundt cake! I just broke out my bundt cake pan for the first time ever and now I’m addicted to baking bundt cakes! LOL. I’m definitely going to try this recipe soon – love pomegranate!